'Glass skin' is the look I've been trying to achieve for years! The term has recently exploded in the beauty scene though, thanks to the K-Beauty skincare gods. It's basically super fresh, dewy, almost transparent looking skin - skin that looks like shiny polished glass. 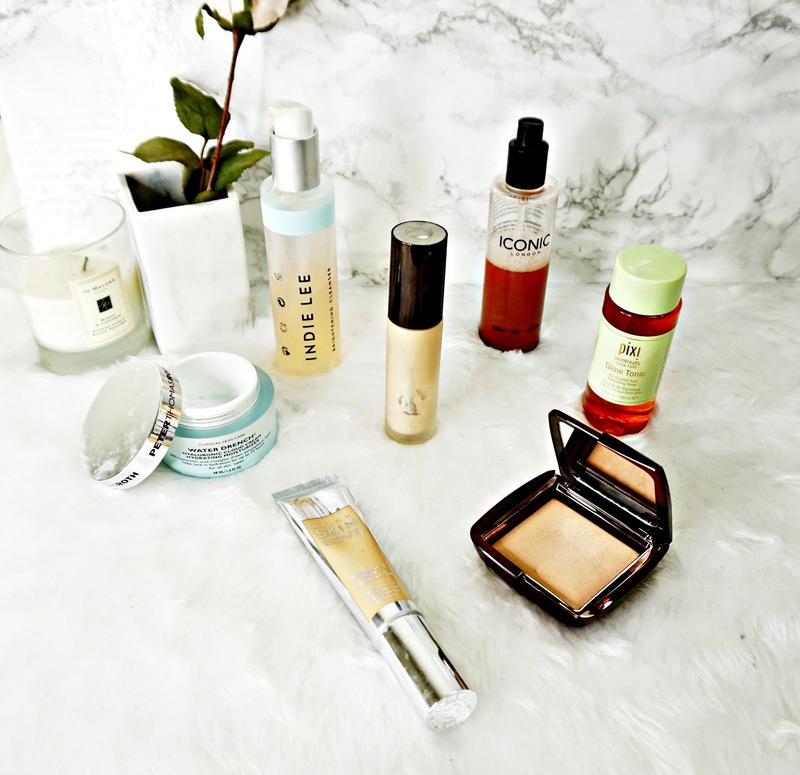 I've put together a little edit of my favourite skincare and makeup that helps me look super dewy and fresh faced. Skincare is the best place to start to achieve 'real' glass skin. Glass skin is clean, fresh and bright without a blackhead in sight so a good cleanser is important. This offering from Indie Lee is perfect. It leaves my skin so clean. It also has brightening properties. It really does leave my skin looking bright and fresh. To get rid of dead skin cells that can build up and leave the skin looking dull, Glow Tonic is what I reach for. It's an AHA toner to is really gentle on the skin. Over time it leaves the skin looking for radiant and refined, as well as helping breakouts and fine lines. An essential when trying to achieve glass skin. I have dehydrated skin which isn't a good look so hydration is super important if I want radiant, polished skin. This is my favourite moisturiser at the moment! It's hydrating without being sticky or oily on the skin. It really helps plump out my skin and it leaves it so smooth. It works well under makeup to. It's just a great all rounder. My skincare favourite that instantly revives dull skin and takes me one step closer to glass skin is this AHA treatment mask for The Ordinary. It's also a high potency of AHAs and BHA to dissolve dead cells, instantly leaving the skin noticeably brighter and so smooth. Whenever I use this I can't stop stroking my face! It also gives my skin a healthy glow! I can't believe how cheap this is considering the results. If like most people you don't naturally have glass skin, here's a few makeup products to fake it. This stuff is like good skin in a bottle. I've used it for years and always come back to. It has light reflecting particles to instantly make the skin look brighter and more glowing. It can be used alone or as a primer. It does make an excellent base for makeup. Foundation glides over the top of it. And the glow this gives can be seen peeking through. For glowing, glass skin foundation this Becca offering is my favourite. It gives the skin a uniform, even finish while covering most imperfections but this doesn't have a heavy, cakey finish on the skin. The formula is so light and easy to blend. This does have a slight glowy finish but it's not shiny or wet looking, nor does it slip and slide throughout the day. This has to be one of the best setting sprays I've tried! It has shimmery particles that you have to shake to mix in. It sets makeup really well and melts powder products into the skin. Leaving the skin with a perfected polished glow! It can also be used as a primer, which it does work really well as. It's a great product. Lastly in the makeup category I have the Ambient Lighting setting powder which gives the skin the most beautiful, lit from within glow! It sets my makeup in place too without feeling drying on the skin. It gives the skin a polished look without looking powdery, which is essential for the glass skin look. There's a few of my essentials for a polished glass skin look.